Sully finally got his helmet on Friday. He's been in physical therapy for months now to try and correct his torticollis and although it's been improving he'll need to wear the helmet for three to four months to help correct his plagiocephaly. He's taken to it quite well and even slept in it all last night with no problems. 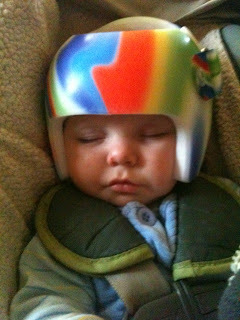 I didn't think it was possible for him to get any cuter but I think he just might be cuter with the helmet on. In other news, I am having a trial run with a house cleaner on Friday, which has prompted a rush of trying to organize things and clean off surfaces around the house. That is exactly what I hated about having cleaners the last time, was how much work it was to get ready for them to come over. I'm trying to come up with a list of the things I want cleaned and then just make sure those areas are able to be cleaned without too much time spent either by me or her pre-cleaning them. We'll see how it goes. It's funny how I want someone to clean my house but then feel embarassed by how dirty it is so I actually end up cleaning it before the cleaner comes. So the battle against clutter was fought well this weekend and I came out on top. The battle with eating better was not fought nearly as well and I definitely came out on the bottom. I find it so much easier to stick with eating better when I'm at work. Being home all day on the weekends is just too much time for me to think about eating and then eventually give in. Maybe I need to start a new knitting project or something else to keep my hands busy - apparently having three kids isn't quite enough!